IF you like the idea of thirteen days to laze around the pool aboard the world's Number 1 boutique mega motor-cruiser, read some good books, indulge in a spa treatment of two, wine and dine 5-star without the need to dress-up, and to be feted but not fawned-over by almost as many staff as there are guests, then you can now go ahead and do so. Because SeaDream Yacht Club's luxury SeaDream II will be doing those thirteen days from San Juan in the Caribbean across the Atlantic to Malaga in Spain on the 15th of April this year, with the price from a very tempting US$3445pp twin-share. This includes exceptional dining recognised by the 2017 Berlitz Guide as Best Ship for Food, wines with lunches and dinners, premium drinks from the open bars, a free onboard golf simulator and fitness centre, a library with over 1,200 books, port charges and taxes, and even gratuities for the attentive 95 staff and crew for just 112 guests. 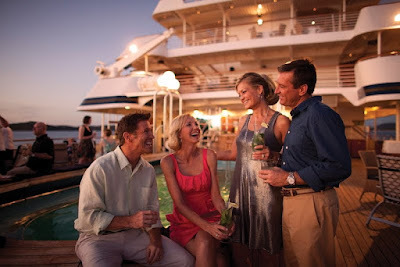 And despite being 5-star, SeaDream does not require jackets or ties at dinner – smart casual is the order of the day. SeaDream II will make only one stop on this thirteen day journey, Funchal on the island of Madeira, where there is an optional excursion taking-in local sights, or the yacht has free mountain bikes for guests who may like to do their own exploration. There are also power and sail water-sports facilities aboard too, should the captain decide on a dead calm day somewhere on the Atlantic to stop for guests to enjoy a bit of water-sports play. SEADREAM Yacht Club does not require jackets and ties at dinner – smart casual is the order of the day.